One of the ZPMC's main offshore products. 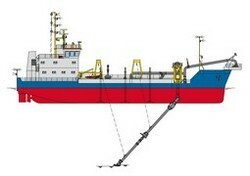 The dredger is mainly used in dredging projects in costal areas. ZPMC provides dredgers in series of types as cutter suction dredger, grab dredgers, and trailing suction hopper dredgers. ZPMC can provide professional designs, manufacturing, and after-sale services to satisfy the clients and meet their requirements. Vosta lmg delivers complete trailing suction hopper dredgers. These tshd's are available in a standard range with sizes between 1. 000 m³ to 3. 000 m³. It is also possible to order custom made vessels in any size or format, such as split hoppers, grab hoppers, (very) large hopper capacity, etc. Van Oord has a strong and modern dredging fleet of various trailing suction hopper dredgers. The new generation vessels currently being built will further modernise our fleet and improve our competitive position on different markets. Trailing Hopper Suction Dredging (THSD) designs have been developed in close cooperation with European owners. The dredger built as per this design is already in operation. Cutter suction dredgers can also be developed to customised requirements of ship owners and can be built in India. Cutter dredger construction packages (building kits) can be delivered at any shipyard in India. We are amongst the most reputed names in the industry, offering Trailing Suction Hopper Dredger. We are engaged in offering Trailing Suction Hopper Dredger.